It's tough getting people to watch a silent comedy. There's a mountain of preconceptions that come with these things, namely that silent comedy is dull, long and, by today's standards, technically obsolete. But it's not! It's really, really not! For better or worse this was a time before safety standards and so you get to see stunts that are dangerously bonkers. 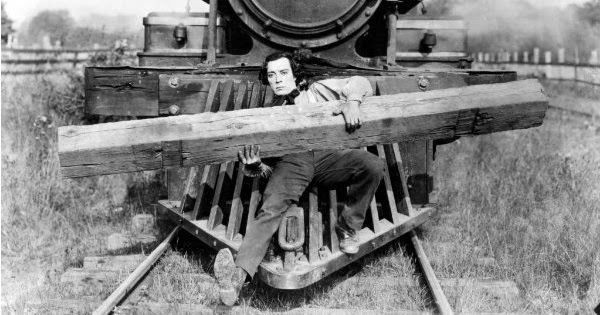 If you're a fan of people risking life and limb for their art then you can't really do better than the films of Buster Keaton. Born the same year as cinema itself, 1895, Keaton quickly established himself as the scrappy upstart in cinematic comedy: the Rolling Stones to Chaplin's Beatles. Never quite scaling the same heights in popularity as Chaplin he worked with smaller budgets, but wringing every single drop of humour and excitement out of them. Though brave and physically impressive, scampering and climbing away from certain death (or at minimum serious maiming) in most of his famous films, Keaton's real secret weapon is his deadpan stare. It's that famous stone face that makes him so damn relatable, even to a modern audience. Keaton's task is to play straight man to a capricious God with a sadistic sense of humour. As the world contorts in every more unlikely ways around Keaton, he refuses to buckle under, dealing with whatever's thrown at him with a combination of bravery, intelligence and straightforward luck. In every Keaton film he usually has one singular goal; winning a woman's heart, a task he'll stop at nothing - nothing - to achieve. The General slightly subverts this formula, sure there's a girl to rescue, but there's another love here - the titular 'General' - a steam train. Keaton plays Johnnie Gray, an engineer in Georgia as the Civil War breaks out. Eager to impress the lovely Annabelle Lee (Marion Mack) he rushes to enlist, though is turned down as he's too useful to the South as a railroad engineer (though he never realises this, puzzled as to his rejection). With her brother and father off to war, Annabelle refuses to speak to Johnnie again until she sees him in uniform. Meanwhile there's a-doin's transpiring up North. A group of Union spies plan to infiltrate the South, steal a train and travel up the railroad destroying bridges, cutting the South's supply lines. Soon Johnnie's beloved train has been hijacked by this motley gang, along with Annabelle, who had the misfortune to be in the luggage carriage. Similarly commandeering another train he heads up the rails to win back his two loves, setting the stage for a feature length train-based chase scene and all kinds of Civil War based derring-do. 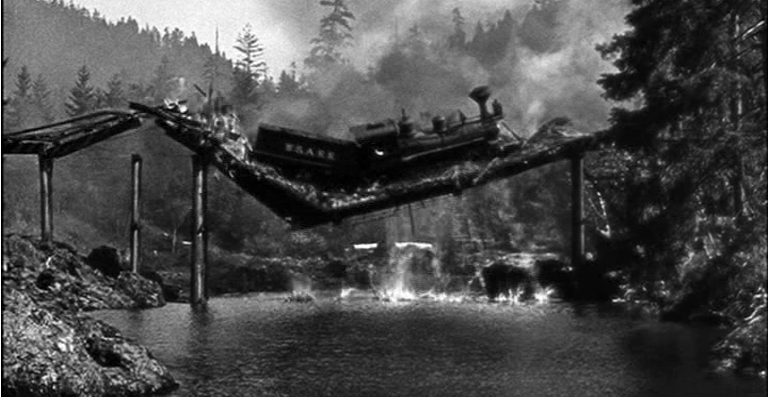 As Keaton gains ground the villains throw all sorts of hazards in his path; sabotaging the rails, throwing blocks of wood in an attempt to derail him, setting him on fire with burning carriages or just simply shooting at him. But Keaton powers through, unstoppable in his self-righteous determination, his stony expression unflickering as things get more and more dangerous. Central to Keaton's films are a focus on action and reaction; consequences and coincidence spiralling out of control into absurdity. The trains fit into this perfectly, the pumping pistons, smokestacks and the physics of the different carriages banging into each other underlining an idea of a person navigating a mechanical, clockwork world. What impresses most about The General is the sense of weight and motion. Even through the silence you sense the momentum and weight of the trains as they rumble down the tracks, Keaton dwarfed and insectlike next to the gigantic machine. Danger is never far away, and as he perches on the cow-catcher at the front knocking obstacles out of the way you realise that if he messes this up he stands a very real chance being of being actually squashed. You can draw a direct throughline from Buster Keaton to Jackie Chan and even through to the cast of Jackass, people who recognise that there's a special, subconscious thrill gained when an audience senses genuine danger on camera. A real train crashing into a real river. No fakery here. Having said all that a confession: though Buster Keaton's films are some of my favourite silent films (I prefer him to both Chaplin and Harold Lloyd) I've never quite understood the mountains of praise heaped upon The General in particular. Widely considered the pinnacle of Keaton's career it's ranked as the 18th best American film of all time by the AFI, made Roger Ebert's 'Top Ten of all Time' and was rated the best silent film of all time by silentera.com. Don't get me wrong, this is obviously a great film, but to my eye both Sherlock Jr and Steamboat Bill Jr are more impressive demonstrations of Keaton's cinematic imagination and mastery of physical comedy. At least a part of this is the sour taste left by the loveable Buster Keaton fighting on behalf of the Confederate Army against the sinister North who - can you believe it - want to abolish slavery. The bastards! Keaton's own explanation was that his character had to be an underdog to get an audience to root for him, and if he was on the eventual winning side the film would seem overly triumphalist. It has the opposite effect on me, painting the Confederate Army as noble heroes feels queasily wrong. I get that this film is 88 years and from an alien political context, but I can only honestly watch it as a 2014 viewer and this stuff leaps out at me. Your best bet is to do your best to politely overlook this and enjoy the film as a remarkable piece of cinema history, though one that's ultimately a product of its time. 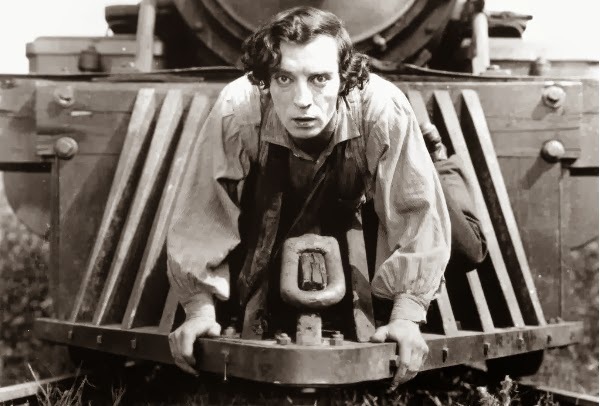 Fortunately The General still has the goods, the stunts still thrilling, the weight of the trains still palpable and even after eight decades you sense Buster Keaton's indomitable charisma - still as vital and attractive as it ever was. With a new 4K master and soundtrack by veteran of silent scores Carl Davis the film has never looked or sounded better. Seeing this on a big screen with an audience gives the film a vibrancy: silent cinema truly coming alive on the big screen. The General is screening at the BFI Southbank from 24th January - 8th February. Tickets here.